Creating a style that is uniquely your own is always a challenge. Kristin feels she has succeeded finding hers and in this stylish interview she explains how she accomplished this and how her hair plays a major role. With age, the answer to this question gets longer and longer, so I will give you the stock answer that is on my freelance profile. I’m 41. I have no hang-ups about getting older. It is a probably eventuality for all of us. 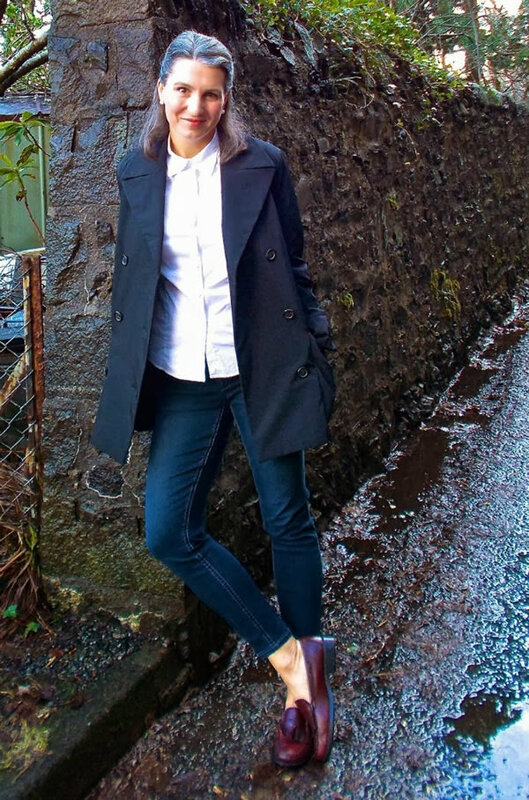 Can you tell us a bit more about your blog Highland Fashionista and why you created it? Like most of the members of my immediate family, I am happiest when I am creating something. With fashion, you get that little buzz of creating something that is uniquely your own every time you put a look together. I wanted to share my passion and love for fashion with “regular” people just like me, while simultaneously indulging my need to create. This is something I have always struggled with. For a long time, I sort of longed to have an archetype…I felt that I needed a “signature” style and that I was without style identity. Having the blog has really cured me of that. The best barometer of what your style really is is sometimes other people. I have had so many people telling me that something is “so you”, I now realize that I do indeed have my own style. It’s Kristin style. That’s not really a great description, is it? Lets call it sporty ecclectic with an edge. Is that pretentious? I like to take something and mess up its hair a bit. Pairing something structured and prim with something casual. I like to keep a balance and add humour to a look; t-shirt and a floor-length lace skirt. A tux jacket with a pair of ripped-up jeans. You get the idea. Scotland. Wet, wet, wet. I pretty much avoid suede (although I did just buy a pair of over the knee boots). Looks that can be layered are key where I live, as on the West Coast of Scotland, the weather is pretty changeable. You have fabulous grey hair and have clearly chosen to go natural. Can you tell us a bit more about that choice and why you chose not to dye your hair as so many of us do (including me)? My choice to stop dyeing actually started out of a place of pure vanity, believe it or not. I saw supermodel Kristen McMenamy in the August 2011 vogue edition of the age issue, and she had this amazing, silver, long, stunning hair that was quite arresting. She is a few years older than I am, but I thought, now there’s is a way to really do something different. Basically, I did it because it would be uniquely my own, and I think it makes a statement about how you see yourself. Do you see your hair as an important component of your style? How I am feeling on any given day is the thing that usually inspires me, although when I am travelling and have more limited choices, I tend to go for uncomplicated, simple things and just add one kind of “funky” element. I used to think about these things more than I do now. Having the blog has really taught me not to limit myself in that way, and to try new things. If anything, I am more adventurous that I was at 20. That comes with age I suppose. I’ve kind of stopped caring what others think when I turn up in a pair of spiky heels, a fringed jacket, and a neon top. Age appropriate is less important than personality or occasion appropriate. The answer, in my opinion, is to really know yourself. The rest will fall into place. I suppose I am as interested in how I look as I have ever been, but there is a shift away from dressing to look like the group and towards dressing to look like me. And I am definitely more interested in fashion; the history of it, what makes a well-constructed garment, past precedents and future directions…I love it all. I get a real kick out of a lot of the freelance fashion writing I do, I learn so much from it and it is an endless source of inspiration. That changes with the winds of time, but I really love my leopard Thakoon coat. I also once did a post that was inspired by my orchid flowers that I grow, and I had a ton of fun putting together looks based on these flowers. I do follow fashion trends. I don’t always try every single one of them, but I like to know what is current and think of ways of incorporating it into my wardrobe if I like it. It’s fun. Gives you something new to look forward to. Don’t dismiss anything out of hand. Try it, all of it. Concentrate on being the healthiest, happiest version of yourself you can be, and let it flow. To be honest, I take a very laid-back approach to my blog. It is rally important to me that I keep my writer’s voice and the blog’s identity intact, so I have a very slow and careful approach to the content as to not get saturated with advertising, giveaways, etc. I love to write, so even though it is a fashion blog, I really enjoy providing that content, however brief. Nope :). I think I’m all out of ammo…. 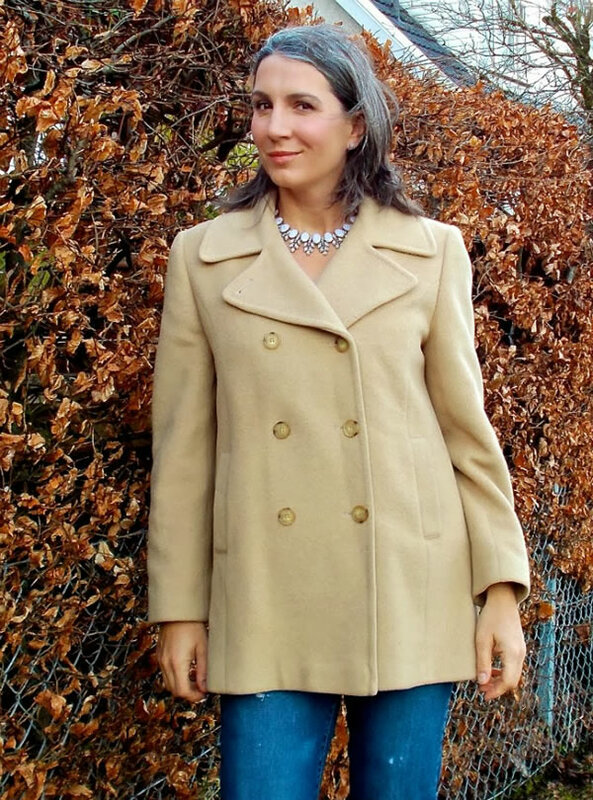 For more inspiration and Kristin’s fabulous writing check out her blog Highland Fashionista! How do you make your style unique? Which of Kristin’s outfits is your favorite? I recently discovered Kristin and her blog and really enjoy her unique style. She’s classic with edge. Thanks for interview so we can get to know her better! I appreciate the thought and care in choices of each item. All the parts are so pleasing to my eye yet playful. She makes striking picks in design and I adore her shoes. Fun to learn more about Kristen. I love Kristin’s blog, her style and her gorgeous silver hair. Great interview, Sylvia. I haven’t been following Highland Fashionista for very long but I already love it and I was very pleased to see her featured here. Kristin has a great writing style and her sense of humour shines through. She always makes me laugh! I particularly enjoy hearing about her thrifting adventures with her family. For those of you who are not familiar with Kristin’s blog, her mother is 70 and looks AMAZING!!! She should be featured here without a doubt…..
PS I like seeing the fabulous scenery in the background of her photos too. I like all her styles. It is like meeting a kindred soul. As soon as I saw the silver shoes I knew. LOL. Love the first outfit and the one with the leopard coat and lime top. Those could have been me. But twenty years further down the road haha. I know Scotland and I know it is wet wet wet. Kudos for her with breezy tops. Fabulous shoes too. Kristin has such great joie de vivre, and sense of humor. It comes through in her style and in her writing. You just think, wow, I bet she’d be fun. Plus she’s gorgeous! Great interview. I love the looks chosen for this post but I have to say that my favorite looks are your casual jeans looks. 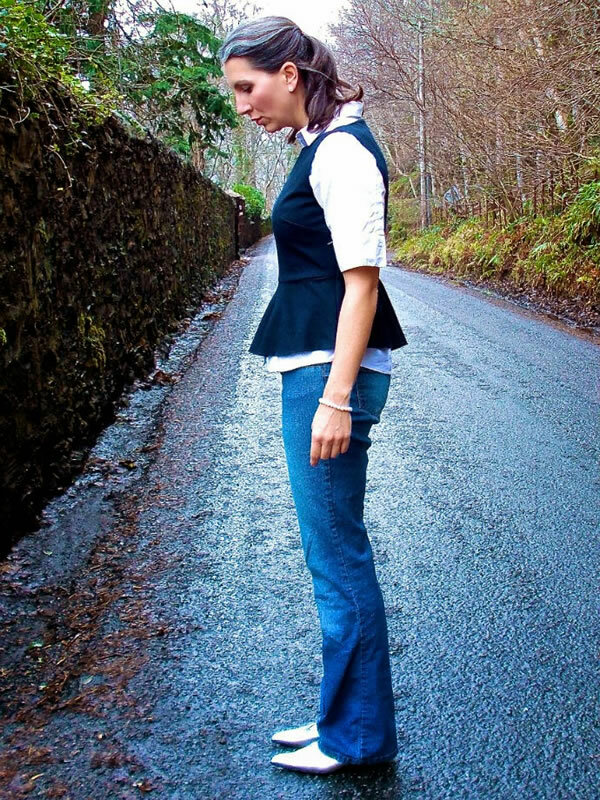 I love the peplum top over the short sleeved white shirt. I can’t wait to visit your blog. Have a great weekend.